Search for all "Syntaxin 1B / STX1B"
Rabbit anti Bovine, Human, Mouse, Rat Syntaxin 1B / STX1B. 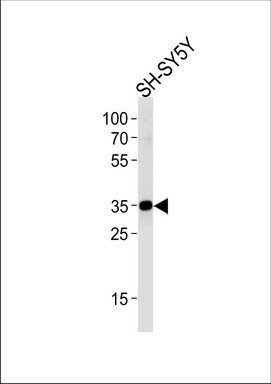 This STX1B antibody is generated from rabbits immunized with a KLH conjugated synthetic peptide between 1-30 amino acids from the N-terminal region of human STX1B. Potentially involved in docking of syptic vesicles at presyptic active zones. May mediate Ca(2+)-regulation of exocytosis acrosomal reaction in sperm (By similarity). PBS with 0.09% (W/V) sodium azide.